Marco's Pizza wants you to eat, share and win! 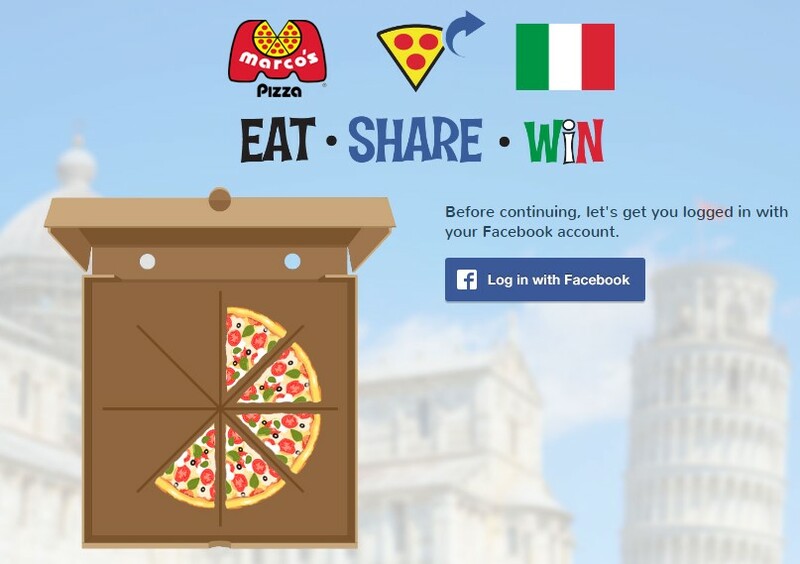 Build a pizza by sharing and for every pizza you complete you get a chance at their spin to win game! One lucky winner will get a trip to ITALY! Other prizes include a brand new Vespa Primavera, a Gucci Bag, Armani Watches, Versace Sunglasses and Pizza and Pepsi for a whole year! GRAND PRIZE (1): Trip for winner and one (1) guest to Italy. Travel must be completed by August 31, 2017. Trip consists of round-trip coach air transportation to/from a major airport nearest winner's home to/from a major international gateway in Italy of winner's choice, double-occupancy hotel accommodations for five (5) nights, and $700 spending money. Approximate Retail Value ("ARV"): $6,100. Pizza Game Grand Prize (1): 2016 Vespa Primavera 50. ARV: $3,650. Pizza Game First Prize (1): Gucci Bag. ARV: $1,980. Pizza Game Second Prize (2): Armani Watch. ARV: $200 each. Pizza Game Third Prize (5): Versace Sunglasses. ARV: $133 each. Pizza Game Fourth Prize (20): "Marco's Pizza and Pepsi for a Year"; awarded in the form of twelve (12) certificates each good for a large Specialty Pizza, 2-Liter Pepsi product and CheezyBread. ARV: $72 each. Pizza Game Fifth Prize (50): "Marco's Magnifico Bundle" consisting of a large Magnifico pizza, a 2-liter Pepsi product and a choice of CheezyBread, CinnaSquares or Brownie; awarded in the form of a certificate. ARV: $14 each. HINT: Even though the rules state you can only enter once, TECHNICALLY, you will want to bookmark this one for your daily entries and share more every day so that you can spin to win more often!